At some point in the development of a squad, there comes a time when they need to prove that it's not just a case of improving anymore, but that they have, in fact, reached a level of consistency that will not tolerate any big surprises. It doesn't mean that they win every game, but if they are to be defeated it should be in circumstances for which there is a solid explanation. Galway have reached that stage and the next test is whether they are good enough to move on again, building ever closer towards All-Ireland title level. They head for Dr Hyde Park tomorrow with possibly the best defensive record that any Galway team has ever accumulated over the first half of the year. One goal (v Monaghan) conceded in eight Division 1 games gave them the highest security rating in the league and they also kept Mayo goal-less in the Connacht quarter-final before giving away one against Sligo in a match they won by 21 points. It leaves Galway with an average league/championship concession rate of 12.8 points, compared with 15.5 for Roscommon, who spent the spring in the much less difficult surrounds of Division 2 before their gentle introduction to the championship against Leitrim. So by all apparent logic, Galway should win tomorrow. But then they were 4/9 favourites to beat Roscommon in last year's Connacht final, only to endure a spectacular collapse in a 2-15 to 0-12 defeat. A year earlier, they were 4/11 favourites to beat Tipperary in the All-Ireland quarter-final, but suffered another defensive cave-in, tumbling to a 3-13 to 1-10 defeat. Kevin McStay will, no doubt, have reminded his team of those two games, especially last year's Connacht final where Roscommon blitzed them early on in Pearse Stadium. "We let ourselves down," said Galway captain, Damien Comer, a remark that could also apply to Galway's performance against Kerry in the All-Ireland quarter-final, when they conceded 1-18. Roscommon go into tomorrow's game as Connacht and Division 2 champions, having won promotion at the first attempt, so their confidence levels are high as they attempt to win the provincial title in Dr Hyde Park for the first time since 2001. With the exception of the setback against Down when they scored only seven points, their attack have been very productive all year, averaging more than 21 points per game, which will make the battle with a miserly Galway defence intriguing. Obviously, high returns are easier to achieve in Division 2, but having unhinged the Galway defence so easily last year, Roscommon will feel there's profit to be had again. Playing flat out in Division 1 - as Galway did on their return to the top flight after several years - followed by the massive challenge of playing Mayo for a third successive year, has made it a gruelling season so far. But then the average age of the team that started against Sligo was under 24 years, so there should be no shortage of physical or mental energy. Besides, they will feel that they need to win the Connacht title to frank the impressive progress made over the last five months. 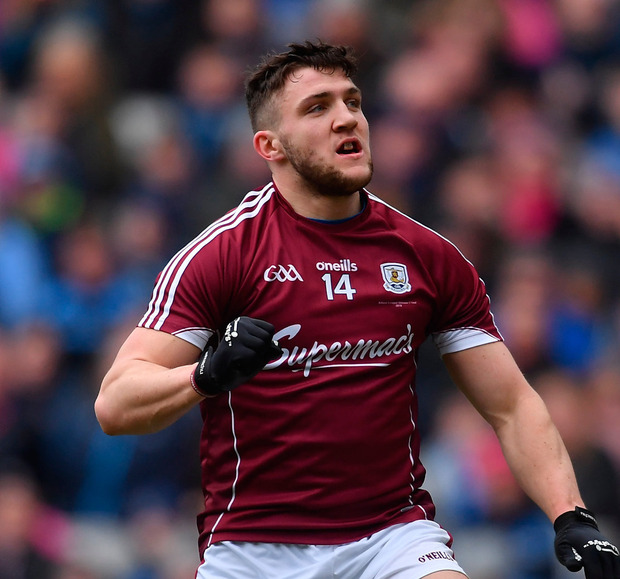 Just as the Roscommon attack believe they are capable of unhinging any defence, their Galway counterparts can also be devastating if enough quick ball comes their way. With home advantage, Roscommon will make it a very difficult day but Galway may have a crucial advantage in the quality of subs they can call on. All of which suggests that Comer will lift the JJ Nestor Cup on what is the 60th anniversary of its first presentation, when the recipient was Galway legend Seán Purcell after the Tribe's win over Leitrim in 1958.